This Applet will crank out well-commented code for implementing Java’s Comparable and Comparator interfaces used for comparing and sorting. Just follow the scrollable instructions at the bottom of the Applet. When you are done, copy/paste the resulting code into your own programs. It will work first time. It will generate code with or without generics. It requires Java version 1.5 or later to run however. for the current version of Comparator Cutter. 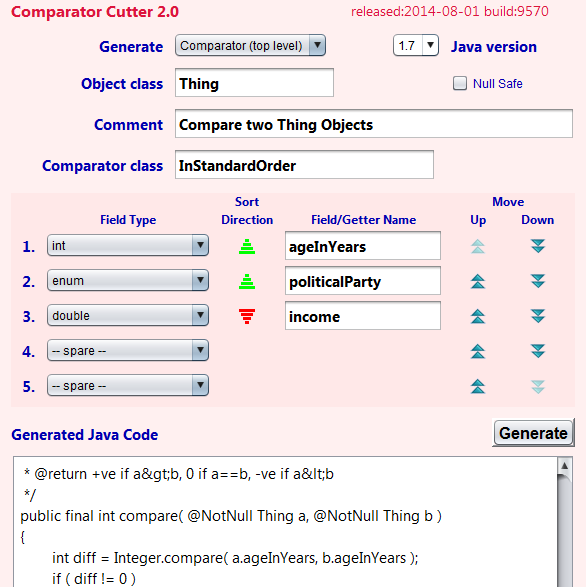 Applet to generate custom code for Java Comparable and Comparator sorting/comparing interfaces. 706K zip for Comparator Cutter Java source, compiled class files, jar and documentation to run on your own machine either as an application or an Applet. access comparatorcutter source in repository with [Tortoise] Subversion client on wush.net/svn/mindprod/com/mindprod/comparatorcutter/. download ASP PAD XML program description for the current version of Comparator Cutter. Comparator Cutter is free. Full source included. You may even include the source code, modified or unmodified in free/commercial open source/proprietary programs that you write and distribute. Non-military use only.